What would be a novel way of engaging people more people with research findings? Academics are wondering if traditional journal articles are still fit for purpose or if an injection of creativity is needed. Gareth Morris looks at how illustrated findings can draw greater impact for researchers. My colleagues and I at the Universities of Salford and Lincoln recently completed a two-year study into homelessness. During this time, a project advisory group, consisting of senior members of homelessness services in Stoke-on-Trent (where the research took place), guided our endeavours as we undertook more than 100 life story interviews with people experiencing homelessness or vulnerable housing. The interviews provided plenty of data. People who have experienced homelessness have led diverse, captivating, heartbreaking, and inspiring lives. And in the telling of these stories, there was regret, shame, pride, success, sadness, and humour. These stories helped us understand what can happen in a person’s life to lead them toward homelessness; these stories were worth retelling to a larger audience. We took an open approach to our research from the beginning (using a research blog, for example) and this gave us valuable knowledge: we knew from talking to our project advisory group that people working in the homelessness sector are unlikely to spend much time reading the latest journal articles and, moreover, will not pay for them given the limited resources available to homelessness services; we also knew that informing more people of the real life stories behind homelessness would require something to draw the eye. We needed to do something a bit different. We published our findings as a graphic novel. We asked Sam Dahl, a recent Masters graduate at the University of Salford, to draw some example pages and show the research team what an illustrated story would look like. There was a high degree of impact to Sam’s initial drawings and we were eager to see some of the stories in full. Over the next six months, Sam illustrated a total of five stories using synopses of the life stories I had written based on interview transcripts. Quotes, also taken from the transcripts, were added to the stories so they could be told by the homeless people themselves. The chosen stories represented a range of experiences that interviews often described such as childhood abuse, substance misuse, family breakdown, rough sleeping, and experience of the armed services. While Sam worked on the illustrations, I researched the various publishing options. Though there are specialist graphic novel publishers and specialist academic publishers, it was important to us to have control over the content, availability, and price of the book. Self-publishing gave us this power. Therefore, we decided to self-publish and, though there are several companies available, we chose Lulu. There were two additional advantages we discovered in this process: firstly, self-publishing works on a ‘print-on-demand’ basis which means that a copy is printed for every copy ordered, even if it is just one; secondly, Lulu distributes via Amazon which means it will be searchable there, also. Once the book was finished, we ordered a batch for the research team to distribute. Many of these were handed out at our dissemination event in Stoke which was attended by public and voluntary sector service providers as well as employers in the city. We also sent some to colleagues in the homelessness sector across the UK. Perhaps our biggest challenge in self-publishing is marketing the book. Our approach to marketing has been opportunistic and ad-hoc: however, we see the book as a resource that those in the sector can use when they need to persuade others (such as funders) of the challenges faced by homeless people and the services that help them. We have received positive feedback from our partners of the interest shown in the book and the issues it raises. Will our journal articles have the same effect? I hope that sharing our experience will add to the debate about academic impact and inspire others to try something different. Do you think that academics should look for inventive methods of engaging a wider audience in their research? Are novel methods of engagement comparable to traditional academic publications? And should one method be valued over another or are the two mutually compatible and achievable? How can a book such as this be better marketed and distributed? Note: This article gives the views of the author, and not the position of the Impact of Social Sciences blog, nor of the London School of Economics. Hi Gareth. Thanks for this terrific post and congratulations on what looks like a brilliant initiative. I think this would have huge scope in a number of different research fields (the fabulous people working in Graphic Medicine http://graphicmedicine.org/ immediately spring to mind) and I wondered if you knew of any other examples of researchers using comics and graphic novels in the context of dissemination? Hi Angela – thanks for the endorsement! I don’t know of other researchers who have used comics and graphic novels before. I’d not heard of Graphic Medicine either but its encouraging to see others looking for different ways of disseminating their work. We did, however, discover the brilliant Psychiatric Tales (Blank Slate Books, Darryl Cunningham) when we were researching this one. Although PT was based on the author’s experience of psychiatric nursing, rather than research, it was obvious that a graphic novel could serve as a very powerful medium. Whether or not other researchers will produce graphic novels in the future only time will tell, but pictorial representation of research, I believe, will always be a winner. I was just sent this article by a former professor of mine. 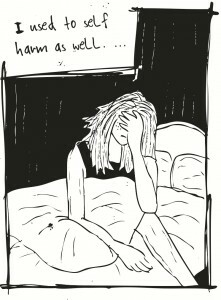 I am a Clinical Art Therapy master’s graduate and for my thesis I created a 90 pg graphic novel based on my experience working with my first client. I used the process notes written after each session and illustrated them. Not only do I agree that this a great way to present academic research and data I actually prefer it to printed word. Thanks for the article, great initiative and interesting reflections on how to publish such work. For other examples there is Nick Sousanis, whose comics dissertation was published by Harvard University Press (the book is entitled Unflattening). There are also other initiatives of this type in France, with many big comics publishers producing their own collection of “science comics”, for instance Sociorama at Delcourt (they publish sociological work in comics, and it’s co-authored by a scientist and an artist), or La Petite Bédéthèque des Savoirs at Le Lombard. There are also few people that are both students and artists that have blogs where they use comics to popularize their discipline (though I only know about the francophone ones)!